This is essential when you start to look for a buying a Sapphire ring. Look for a gemology report from a recognized gem laboratory like the GIA or certification from an independent GIA G. G gemologist who has expertise on Corundum stones (Sapphires & Rubies). This is essential in a world where 85% of sapphires sold, both in stores & online, have been chemically enhanced. These enhanced colour stones carry similar values to synthetic Sapphires. Most reputable Jewelers will be happy to provide a report from a recognized Gem Laboratory, such as the GIA, unless the Sapphire has being treated - always ask ! We have added below a link to the top gem laboratories for sapphire identification. From here can scroll through who these labs are as well as contact information and address & contact numbers. Critical, almost 80% of a natural Sapphire's value is based on it's color. Whether you are looking for a traditional Blue Sapphire or you may be looking into the fancy colored Sapphires, such as Pinks, Yellows, Purples, Violets or the natural color-changing Sapphire's. You can find Sapphire's in all these colors coupled with different Hues, Tones and Levels of Saturation. The most prized or valuable Sapphires are stones which carry a strong Hue along with the same level in Saturation with few to no secondary colors. 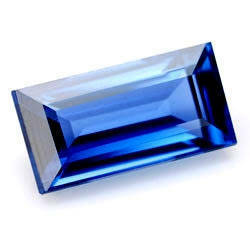 As an example, a Royal Blue Sapphire will carry a greater value than a Sapphire with a lighter color blue. 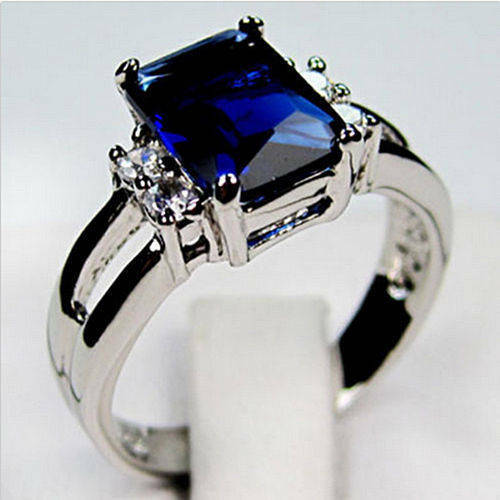 Remember, when looking for your Sapphire choose a Sapphire color which appeals to you. 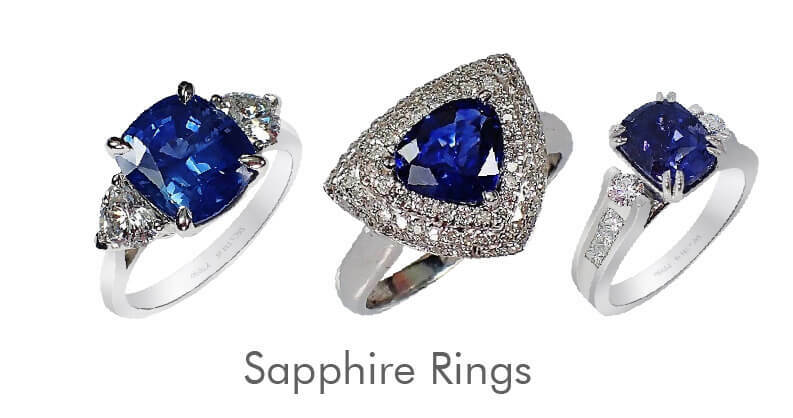 The Sapphire Ring Co. keeps in stock Sapphires of all colors in a variety of Hues,Tones & Saturation along with an explanation of how the Sapphires are graded. Sapphires, along with all gem stones, are graded on both their Hue (Main color), Tone, which shows how dark or bright a sapphire is, and Saturation which determines the strength of color. For a more detailed explanation please view the GIA's colored gem stone chart under. Sapphires can be found in almost any cut from the traditional Oval through to Round and Cushion with the more fancy cuts such as Heart,Trillion, and Pear cut stones also available. There are certain cuts like the emerald cut which are among the rarest due to the loss of weight when cutting it from the rough stone. Sapphire Ring Company carries a wide selection of sapphire in a variety of cuts. View our educational pages on sapphires & theie cut's. With all gem stones, the carat weight can dictate the value of the Sapphire and, like a diamond, the higher the carat weight the greater the value especially where Sapphires are in the royal blue to vivid blue colors. The greater carat weight principle applies to all the rainbow of colors that Sapphires can be found in. 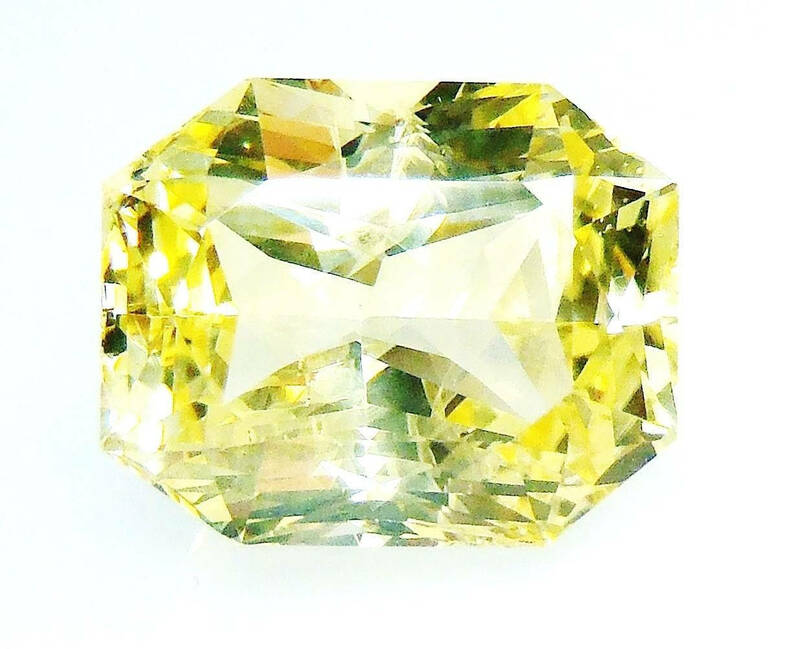 For example, a 3 ct sapphire in a cushion cut can fetch as much as $3,500 per ct. A similar choice of Sapphire in the same color but weighing 4 cts, will see prices can jump by as much as 30% per ct. Once above 5 cts the prices can rise by over 50% per ct. The Sapphire Ring Co. buys direct from the mines and markets in Sri Lanka allowing us to offer all of our Sapphires at or below wholesale prices. Unlike a diamond, a Sapphire's clarity is not as important to the stones overall value. This is particularly true when looking at the darker hues. However, the clarity of the stone does play more of a role when looking at a Sapphire in the lighter colors or pastel shades. The Gemology appraisal is always a good way to check the grading on a Sapphire, as well as allowing to you view the grading on the stones Clarity, Cut & Polish. This mixed princess cut untreated Ceylon sapphire has incredible clarity along with cut & polish which is needed due to its light hue & tone giving this sapphires its brilliance & luster. Sapphires can be found all over the world with countries like Australia, Africa and Asia being some of the largest produces of both commercial grade Sapphires as well as gem quality stones. 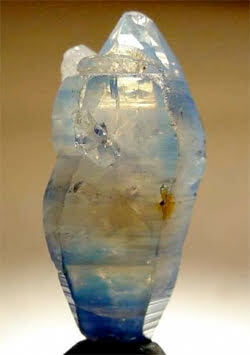 Sri Lanka, formally Ceylon, along with Madagascar produces the worlds best and finest stones. The Sapphires from Sri Lanka (Ceylon) have to date provided the world's very best stones. Sapphires from Sri Lanka (Ceylon) will fetch a premium prices of 20% or more. These Sapphires, in almost all colors (Except Red - Ruby), have few to no secondary colors with the purest Blues, Pinks and Yellows. 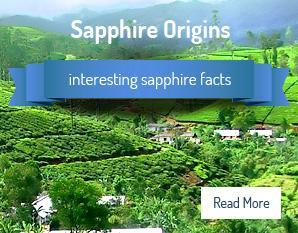 The Sapphire Ring Co's sapphires all come straight from Sri Lanka, giving you the best choice in color and quality. Sapphire mining in countries such as Madagascar and Africa, are extracted very poorly with unsafe working conditions often along with the use of child labor. For these reasons, we will not buy from these areas or countries, listing them under the same category as "Conflict Gem Stones". Click on the above map to see our pages on sources of non-conflict gem stones. Sapphires are graded as a 9 on Mohs scale of hardness, with a diamond being a 10. Sapphires have, for thousands of years, been selected both for rings and jewelry because of their durability. Sapphires have throughout history been selected as jewels for the crowns of all European royal families, as well as being set into pieces which are thousands of years old. Selected because they have retained their beauty and color throughout the periods with out fading or wear. A Sapphire and Diamond ring will last you a life time and are often chosen to be passed down from generation to generation. All the Sapphire Ring Co's Sapphire rings are custom made for each individual Sapphire. Today, many of our custom Sapphire rings are being set into platinum, recognized as the "Rolls Royce" of alloys. 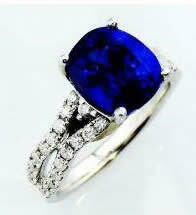 But we also carry a large selection of 18 kt white gold custom sapphire rings. So, whether you are choosing a Sapphire ring as an engagement ring, an anniversary or simply a gift for the one you love, our selection of "one of a kind" custom made natural Sapphire rings provides you with the finest pieces of jewelry that can be found in one place today. Sapphire Ring Co, 18 Kt White Gold Signature ring custom made to every sapphire available in both yellow gold,rose gold & platinum. Our sapphires go from mine to ring, Sapphire Ring Office in Sri Lanka (Ceylon) allowing our custom sapphire rings for sale wholesale prices. All of our loose Sapphires & custom Sapphire rings are listed for sale at or below wholesale prices. Whether you opt for one of our current custom made sapphire rings or look into a special hand made Sapphire ring, we are always happy to pull any Sapphire stone from one of our existing settings and set this Sapphire into you own custom ring to your own design. Or you can choose from our 400 plus "archive" Sapphire rings. 10. Choosing the right sapphire ring. Once you have check marked through the nine points made above you will know now that not only are you are buying a natural Sapphire but, you will also have understood something of the history behind the origin of the stone as well as being able to make an informed decision on the right cut & color - you are on the right road. 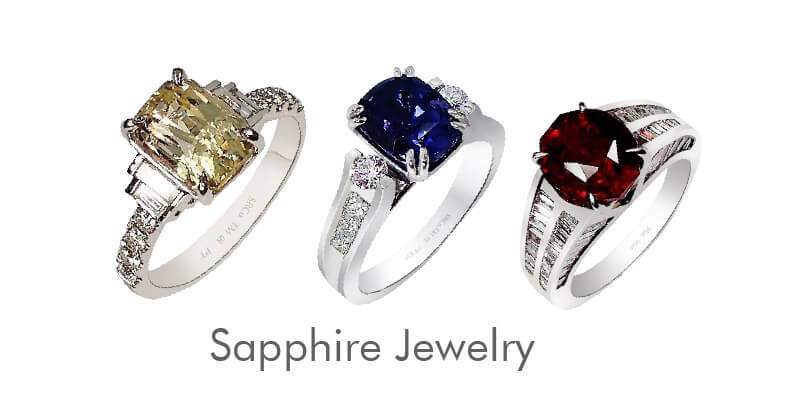 For more information on our sapphire rings visit us at or call us at 727 797 0007.